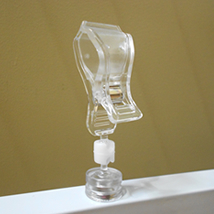 Easily change out your promotional signage with a simple clip holder! Magnetic base attaches to your fixtures, displays or any metal surface. Large clip grips materials up to 1-1/8" thick. Bends for adjustment to almost any position. 3 1/2 inches High. Sign sold separately, search sign cards.